The best part of Consumer Reports magazine is its inside back page, "Selling It," covered in funny advertising bloopers. 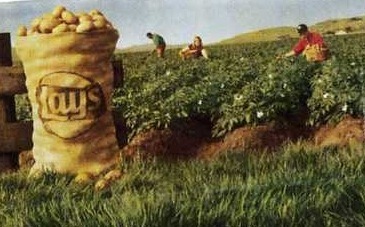 The August 2008 issue features an ad for Lay's potato chips with an illustration of farmers picking potatoes off blossoming plants. Looks nice, right? Except that you don't harvest potatoes while the plant is still blooming. And in order to get those plump spuds, which grow underground, you need to dig for them, not simply pluck them as you stroll by. A Frito-Lay rep defended the ad by telling Consumer Reports,_ "The way \[potatoes are\] really harvested isn't a pretty picture." Maybe next advertisers can convince consumers that boneless, skinless chicken breasts grow that way all by themselves.